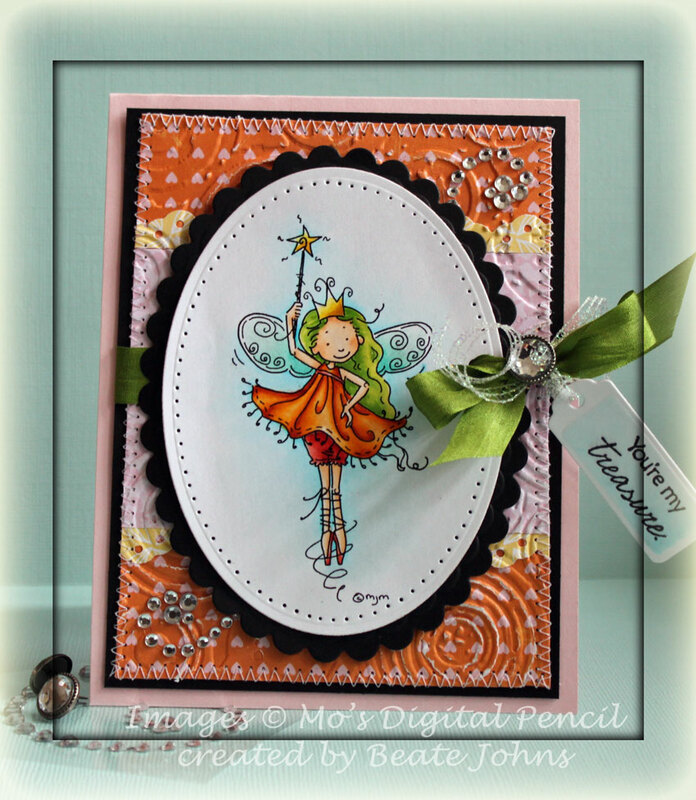 I created this card back in March for a Free For All Challenge on Splitcoast and a challenge on Mo’s Digital Challenge blog. Mo’s challenge was to use a baby image, the Free For All Challenge was to create something St. Patrick inspired (greens, good luck charms). 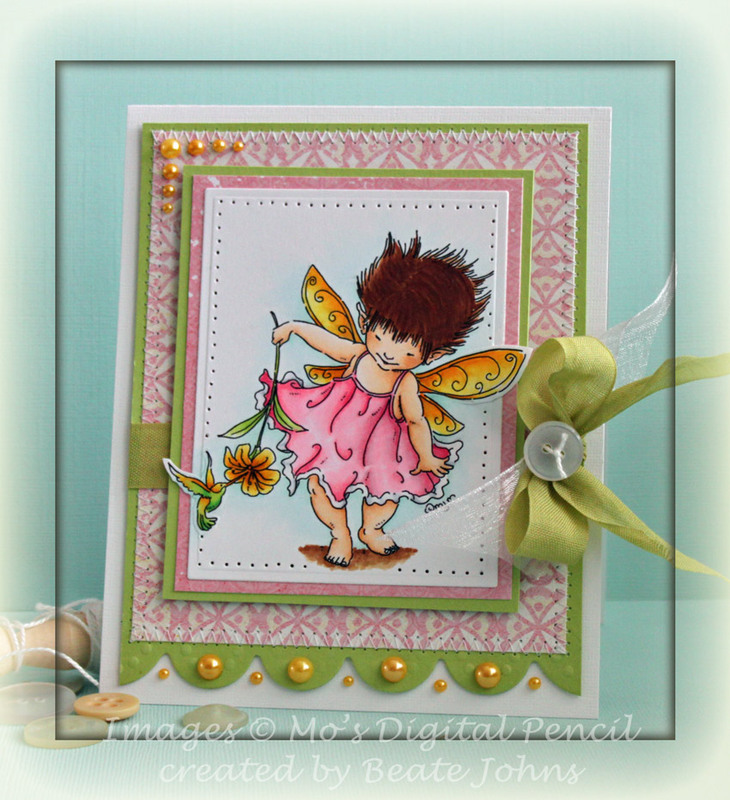 I printed Baby Fairy Flora out on Neenah Solar White cardstock and cut her out with Classic Circle Nestabilities die. The image was colored with Copic Markers (Bow: R20, R21, R22, Flowers: Y11, Y13, Y15, Leaves: YG01, YG03, YG17, Basket: E30, E31, E33, Background: BG0000, BG000, BG01, Ground: T0, T1, T3). The image was layered on a piece of Black cardstock, cut and embossed with Blossom Nestabilities dies. The edges of the image layer were paper pierced. A piece of white cardstock was cut and embossed with big scalloped circle Nestabilities and airbrushed with Copic Marker YR15. A 2 1/2″ x 4 1/2″ piece of Springtime Echo Park paper was adhered over a 4 1/2″ square of Little Boy Echo Park paper. A 4 1/2″ wide strip of White cardstock was cut and embossed with the Lattice Borderabilities die and adhered underneath the horizontal strip. The layers were stitched to a 3/16″ bigger piece of black cardstock. May Arts Gingham Ribbon was tied around the horizontal strip and topped with a big Recollection brad. The layers were adhered to the card base, a 5″ x 10″ piece of Neenah Solar White cardstock folded in half. The sentiment is from My Favorite Things Clearly Sentimental about you. It was stamped in Tuxedo Black Memento Ink on a piece of Solar White cardstock, cut and embossed with Petite Oval Nestabilities dies. The inner part of the oval was colored with Copic Markers BG0000 and BG000. It was adhered to the lower right of the image. Black Kaisercraft Rhinestones finish off the card. I created this card for another VSN challenge from February. I printed Michael from Mo’s Digital Pencil on Neenah Solar White cardstock. It was cut and embossed with Label 11 Nestabilities and colored with Copic Markers (Cloud: Bo000, B91, Skin: YR0000, YR000, YR00, Wing: YR000, YR12, E95, Hair: Y11, Y32, Y26, Shirt: YG01, YG03, YG17, Background: YR31, 1/5th YR31, W3). The image was adhered to black cardstock that was hand cut into a slightly bigger layer. A 1 3/4″ x 4″ piece of For The Record Echo Park Paper was adhered to a 1/4″ wider piece of the same paper pack. Both layers were adhered to a 4″ x 5 1/4″ piece of paper, also from the For the Record Paper. All layers were stitched to a 3/16″ piece of black cardstock. White Organza May Arts ribbon was adhered around the horizontal strip before the layers were taped to the card base, a 5 3/4″ x 9″ piece of Apricot cardstock, folded in half. Another piece of Organza ribbon was tied into a bow with the Bow-Easy and topped with a Glitter Recollections Brad. The bow was adhered to the lower left corner of the image layers. A piece of Springtime Echo Park Paper was cut with Classic Circle Nestabilities die and was adhered to the upper right corner of the layers. The image layers were adhered to the card base with dimensionals. The sentiment is from Flourishes Angelic Love. It was stamped in Tuxedo Black Memento Ink on Neenah Solar White cardstock. It was cut and embossed with Petite Oval Nestabilities die. The inner oval was colored with Copic Marker B0000. Silver Kaisercraft Rhinestones above the green paper circle finish off the card. This weeks Sweet Stop Challenge was a fun one. I hope you have time to play. I had this cutie image half colored laying around my stamp room for over a month. It was perfect for the oval image panel for this sketch. The image is from Mo’s Digital Pencil and is called Birthday Fairy. It was printed out on Neenah Solar White cardstock, cut with Petite Oval Nestabilities dies and colored with Copic Markers (Skirt: Y11, Y13, Y15 Top: R11, R12, R14, BG10, BG11, BG13 Wings: BG0000, BG000 Cupcake: E31, E33, E34, R11, R12, R14 Hair: Y21, Y23, E33 Skin: E000, E01, E02 Ground: C3, C5, C7, C9 Background: B0000, B000, B12). The oval was adhered to a piece of Canyon Brown cardstock, cut and embossed with a Scallop Petite Oval Nestabilities die. The wings were covered in Stardust Stickles, the Cupcake with Yellow, Orange Peel and Stardust Stickles. A 5″ long strip of white cardstock was cut and embossed with the border die from Flower Doily Accents. It was adhered underneath a 2 3/8″ x 5″ piece of Echo Park 6″ x 6″ Walk in the Park paper. The layers were adhered to a 5″ square of the same paper pack that had been stitched to a 3/16″ bigger piece of Canyon Brown cardstock. All layers were adhered to a 5 1/2″ x 11″ piece of Kraft cardstock, folded in half. A piece of Melissa Frances white ribbon was adhered on the lower part of a 3″ x 4 1/4″ piece of Walk in the park paper. The paper was stitched to a slightly bigger piece of Kraft cardstock before the layers were adhered to the card base. The image layers were adhered over that with dimensionals. The sentiment is from The Cat’s Pajamas Birthday Bunny set. It was stamped in Tuxedo Black Memento Ink on Neenah Solar White cardstock and layered on a slightly bigger strip of Kraft cardstock. Tissue paper was cut with a flower die from the Flower Doily Accent die set and topped with a Rhinestone brad. It was attached to the upper right hand side of the image layers. A Recollection Rhinestone swirl was adhered next to it. The blue flower is from Prima, the white flower on the lower left corner is from Zva creative. They finish off the birthday card. I created this card last weekend for a fellow SCS member I met at CHA several times. She is expecting her first baby in May. Her best friend contacted me and asked if I could send a card to her that she could give her friend at her baby shower. How sweet is that? I used the Waltzingmouse sketch #38 for my layout and this wreath from Kirkland as my inspiration, since that was the site for that Saturday’s inspiration challenge. I printed Mo Mannings Baby and Bunny on Neenah Solar White cardstock, cut it with a Classic Oval Nestabilities die and colored it with Copic Markers (Skin: YR0000, YR000, YR00, Hair: Y21, Y23, Y26, Pillow: YG00, YG01, YG03, Bunny: E40, E41, E42, E43, E44, R20, Ground: T0, T1, T3, Sky: B0000, B000). Two pieces of Pebbles Happy Go Lucky Patterned Paper were adhered together, cut and embossed with a Grand Nestabilities Circle die and stitched to a piece of Kraft cardstock that had been hand cut into a slightly bigger circle. White lace (bought at JoAnn’s) was adhered over where the two papers meet and green sheer ribbon was tied over that. The image was adhered over the ribbon and lace with dimensionals and three buttons were stitched to the upper left hand side of the layers. The sentiment is from Whimsy Stamps Oval Snippets set. It was stamped in Tuxedo Black Memento Ink on Solar White cardstock that had been cut and embossed with one of the Tag Trio dies. The tag was tied to the sheer ribbon bow with May Arts Curling Iridescent ribbon. The card base is a piece of Textured Whisper White cardstock folded in half, cut and embossed with a Scallop Grand Nestabilities dies. A Recollection Rhinestone Swirl on the bottom left finish off the card. I created this card for one of the VSN challenges last weekend. For this one you should Mash two techniques together. I picked paper piercing and dry embossing. For my image I chose one of Mo Manning’s little Fairies. She was printed on Neenah Solar White paper and cut and embossed with Petite Oval Nestabilities dies. The image was colored with Copic Markers (Dress: Y32, Y17, YR15, YR18, underpants: R20, R21, R22, Crown and Wand: Y11, Y13, Y15, W2, Hair: YG21, YG23, YG25, Skin: E50, E51, E53, Background: BG0000, BG0000), layered on a piece of black cardstock cut with Scallop Petite Oval Nestabilities and the edges of the image were paper pierced. Clear Spica pen was used to add a subtle sparkle to her crown, wand and wings. Two 3 3/4″ long strips of the yellow Echo Park Springtime paper were punched with a border punch from Stampin’ Up. They were adhered to a 3 3/4″ x 5″ piece of orange paper from the same paper pack with a piece of pink Springtime paper in between. The paper was dry embossed with Tim Holtz Retro Circles Embossing folder and stitched to a 3/16″ bigger piece of black cardstock. 1/2″ green silk ribbon was tied around the layers and topped with a Rhinestone Recollection brad. A sentiment from My Favorite Things Clearly Sentimental about you stamp set was stamped in Tuxedo Black Memento Ink on Neenah Solar White cardstock and cut and embossed with the small tag of the Tag Trio die set. It was tied to the brad with Iridescent May Arts Curling Ribbon. The card base is a piece of 4 1/4″ x 11″ Pink Pirouette paper folded in half. Recollection Rhinestone swirls finish off the card. Isn’t that the cutest image? It’s called Bunches and it is from Mo’s Digital Pencil. I have to tell you that I love my new Laserjet printer I bought the other week. No more smearing and it was only $99 on sale at Best Buy! Plus it’s wireless, so I don’t have to drag my laptop in the other room to print! I am loving it!!! 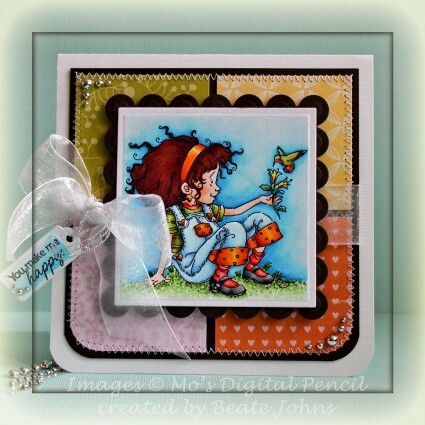 I created this card for Sunday’s Featured Stamper Challenge on Splitcoast. This week the featured stamper was StampGroover. I picked this card of hers to case. I kept it a spring card with the same main colors (yellow, red, green). I did have to add a bit more patterned paper, a bigger ribbon and some bling. The image was printed on to Neenah Solar White cardstock, cut and embossed with Label 3 Nestabilities and colored with Copic Markers (Yellow Flowers: YR21, YR24, YR14, Red Flowers: R02, R05, R08, Dark Red Flowers: R24, R29, R39, Leaves: YG01, YG03, YG17, Purple: V12, V15, V17, Dress: YR21, YR31, 1/5YR31, Hair: E15, E19, E18, Sky: B0000, B000, B91). The image was adhered to a piece of black cardstock, cut freehand and the edges of the image layer were paper pierced. A 2″ x 5″ strip of Echo Park For the Record was adhered to a 4″ x 5″ piece of the same paper line. The bottom corners of the paper were rounded, before they were stitched to a 4 1/4″ x 5 1/4″ card front. White May Arts Silk Ribbon was tied around the vertical strip before the card front was adhered to a 4 1/4″ x 10 1/2″ piece of Neenah Solar White cardstock folded in half. (I don’t like to show stitches or ribbon on the inside of the cards.) The bottom corners were rounded. 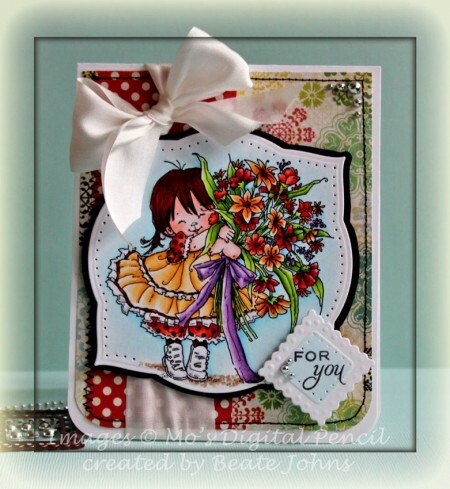 A sentiment is from Flourishes stamp set Tag Lines. It was stamped in Tuxedo Black Memento ink on a piece of Solar White cardstock, cut and embossed with the smallest Lacey Square Nestabilities die. The inner panel of the square was colored with Copic Marker B0000. Silver Recollections Pearls (thanks to Silke Ledlow for letting me know that you can get those at Michaels!!!) finish off the card. 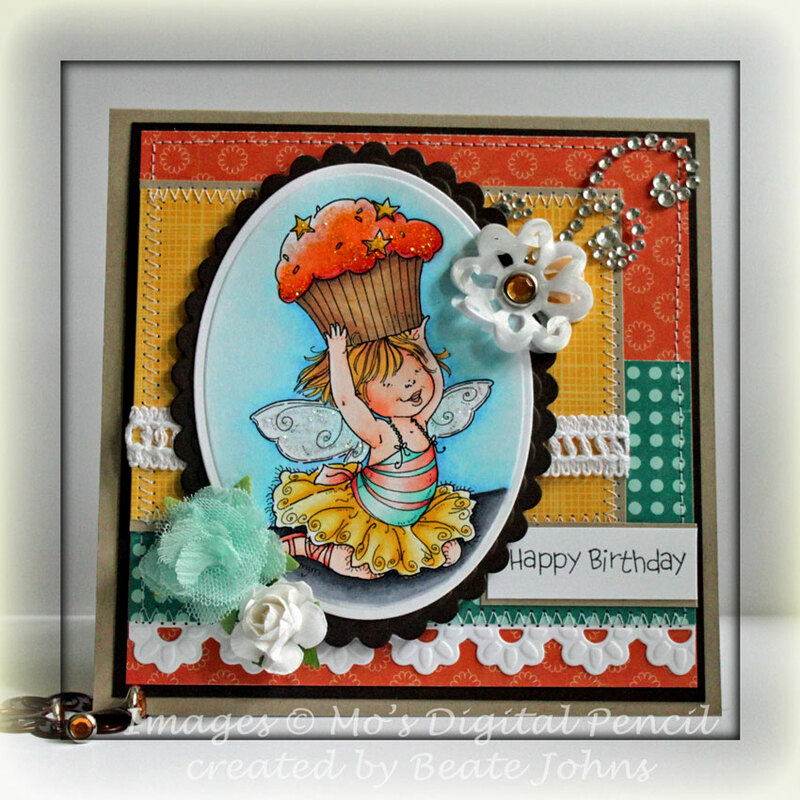 I created this card for last Sunday’s Featured Stamper challenge. Lori’s gallery was amazing to explore. Talk about gorgeous coloring and cards!!! She had used a lot of Mo’s Digital Pencil images. After already seeing Alice Wertz and others create gorgeous cards with them, I couldn’t help myself and ordered a few. My inkjet printer made me angry. The images always smear a bit when I color them with Copics. So I bought a Laserjet printer at BestBuy on sale for $99. I will let you know how that goes. For my card to case I picked Lori’s beautiful fairy card. I also picked a fairy from Mo’s, her Baby Fairy Yuriko. I stayed in the pastel color group, just switched out her blues with pink. I kept her layout, but added some stitching, Border and Pearls to my case. The image was printed out, cut and embossed the image with the largest Rectangle Nestabilities die and the Out of the Box Technique. It was colored with Copic Markers (Hair: E34, E37, E39, Skin: E50, E51, E53, Wings: Y13, Y15, Y17, Y38, W2, Flower Leaves: YG01, YG03, YG05, Bird: YG01, YG03, BG13, Y13, Y15, Y38, Dress: RV10, RV13, RV14, Ground: E33, E35, Background: BG10, BG0000) and layered first on a piece of Echo Park’s Life is Good paper, then on a 3 1/4″ x 4 1/8″ piece of Sour Apple Cardstock. The edges of the image layer were paper pierced for an extra border. A 4″ x 4 3/4″ piece of Life is Good Echo Park paper was stitched to a 4 1/4″ x 5 1/2″ piece of Sour Apple, which had it’s bottom edge cut and embossed with the Petite Fair Isle Borderabilities die. Avocado Linen Ribbon was tied around the layers with a piece of May Arts Organdy tied in and topped with a button from my Mom’s stash. The card base is a 4 5/8″ x 11 1/2″ piece of Textured Whisper White cardstock folded in half. Yellow Kaisercraft Pearls finish off the card.